You know, sometimes we just have to do something different if we want to solve a problem, especially if its been hanging around for too long. We might need to approach our doctor and say to him that we feel we need to try something different. He or she will be available to help as much as possible, but for this part of your own cure you might need to take charge of your own exploration. Your doctor may have taken the conventional route as far as he’s able at this point in time, and will be happy to assist you to help yourself. We can also help you. The m3health Program and monthly m3Health newsletter are carefully designed to help those people who have arrived at the realisation that now is the time to help themselves. The start of the third millennium is as good a time as any to embark upon a journey of discovering what you can personally do to recover from this illness and prevent the next one. When you’re ready, we’re ready. The m3health subscriptions provide a lifelong health companion. Not only your health companion, but a guide to stimulate and encourage you to follow your own unique journey. We hold your hand in the early days and provide a range of signposts and checkpoints. You can have direct contact with us if you want it. You will come to realise the cost of total reliance upon others for your health, for whilst they may cure us of symptoms which we didn’t like, another problem may arise in the place of the one just removed, or is caused by the treatment of the first problem. In order to continuously heal we must address the very nature of illness and health. We need to do this ourselves, with our doctor’s help. A lifetime journey such as the m3health Program is an ongoing inquiry and is very exciting to undertake. The m3health Program is energising, enlightening, revealing and very, very forgiving. People call us five years after having taken the Proram and having read it once again, been taken to a new level of understanding. It opens up new ways of viewing many of life’s difficulties. We invite you to take this journey with us. 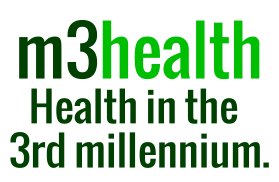 Welcome to m3health, Highway to Health in the 3rd millennium.